Add Dijon and/or grain mustard. Add caster sugar and/or honey. Add finely chopped herbs if using. Shake, mix or whisk thoroughly. Taste and adjust seasoning, mustard, sugar/honey, oil or vinegar if necessary or to your own taste. Pour into serving jar or fancy dressing bottle as in the photo. Keeps for about 2-3 weeks in the warmer/top part of the fridge. Take out of the fridge 5-10 minutes before using to allow the oil to soften/liquefy. Give it a good shake and dress your salad to taste. Easy! 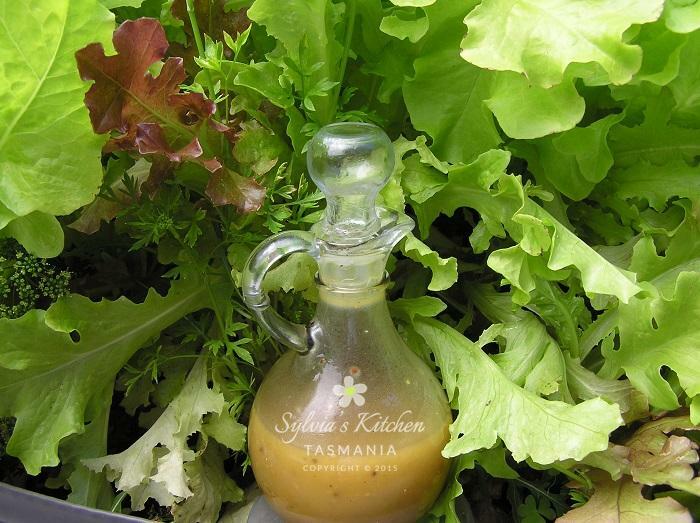 If you wish to add finely chopped fresh herbs to the vinaigrette it is best used fresh and within a week or two. The vinaigrette keeps longer if no fresh herbs are added. You can always add finely chopped chives, parsley leaves or any other soft leaf herb to lovely fresh lettuce leaves in salad bowl before dressing with the vinaigrette. Taste. Experiment. Enjoy! Be the first to learn about class updates and, if you like, Like us on Facebook. This entry was posted in Autumn, Cooking & Kitchen Tips, Local Produce, Recipes, Spring, Summer, Vegetarian and tagged Anzac Biscuits, Local Produce.